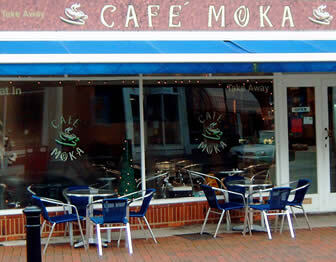 The above shop frontage for Café Moka was ink jet printed onto white vinyl and then applied to the header panels. 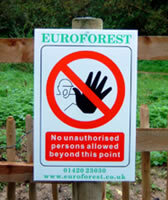 We can print large banners and signs in any number of colours, including four colour process. Our largest print area is up to 2.4m x 1.2m. 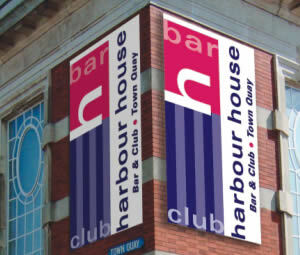 In addition to screen printing, banners can be output digitally onto vinyl and other banner materials, such as course mesh material as shown (below) at Harbour House. The course mesh material used for these banners, allows visibility through the banner and also provides wind protection. 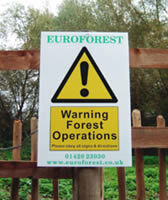 These 600mm x 400mm signs (above) for the Forestry Commission were printed onto 4mm white correx.